This month I participated in a fun blogger event — the secret recipe club. how does it work, you ask? Every participating blogger is secretly assigned another blog + chooses a recipe from that blog to make. On reveal day (today! ), all of our posts go up at the same time, so everyone gets to see who was assigned to their blog, which recipe they chose, + how it turned out. Fun, huh? This month, I was assigned to the blog frugal antics of a harried homemaker, + when I stumbled across her post on homemade sugar cookie bars, I knew I had to look no further – I had found the recipe that I wanted to make. so, how did they turn out? Absolutely, positively amazing. For real. As some of you know, I’m frequently take-it-or-leave-it when it comes to sweets, but I was definitely all ‘take it’ when it came to these bars. The sugar cookie part is just sweet enough, with a wonderfully buttery flavor + a lovely, soft texture. The homemade buttercream frosting adds a brighter, richer sweetness, which pairs perfectly with both the flavor + texture of the cookie. Add a bit of pretty color to the frosting (I opted for pink) + some colorful sprinkles + BAM! A delicious, fun dessert. These were a huge hit with everyone who tried ’em, + I honestly felt a bit gloomy when there were no more left to be eaten. I will definitely be making these quick, easy-to-make treats again soon – thanks to kristen at frugal antics + the secret recipe club for helping me find a new go-to dessert! In the bowl of a stand mixer, mix together the butter, granulated sugar and powdered sugar at a medium speed until light and fluffy – about 2 minutes. Add the eggs and vanilla and mix for 1-2 minutes more. Stir in the lemon zest, flour, baking powder and salt. Mix until just combined – do not overmix. Lightly grease a 9×13-inch baking pan with cooking spray. Press and/or spread the sugar cookie mixture gently into an even layer into the bottom of the pan. (Amy’s note: your hands are the best tool to easily press the dough into the pan, if you don’t mind getting a little messy). Bake for 10-13 minutes. Don’t overbake! The bars shouldn’t have any color around the edges and barely be set in the middle. Let the bars cool completely before frosting. For the frosting, using a stand mixer, beat together the butter and powdered sugar until smooth. Add in the vanilla extract and mix. Add the milk or cream and mix until the frosting is light and fluffy. Add the optional food coloring, if desired. Frost the cooled bars with the frosting, using an offset spatula, and top with sprinkles, if desired. Cut into bars — 18, 24, or more, depending on how big you want them, and serve! These bars are quite rich, so smaller squares may be preferable. *Amy’s note: These were even softer + more delicious after being stored in an airtight container/tupperware overnight. I recommend making them one day before you want to eat ’em, storing them overnight, then serving them the next day. They’ll keep for about a week in an airtight container, but they definitely won’t last that long! Glad you liked them! They are one of our favorite treats. 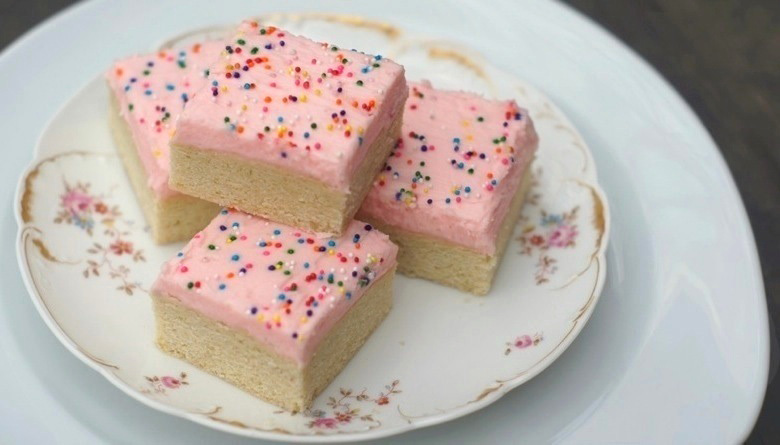 Love these sugar cookie bars. These sugar cookie bars look amazing!! Your bars look so pretty and I don’t know that they’d last overnight in our home to enjoy them softer and more delicious. ha! you’re right – these little treats do go quickly. =) thanks for stopping by my blog – it’s great to meet you, + your fudge heart bites from group A turned out gorgeous! I have always wanted to make these. In fact I justbought easter themed sprinkles to use for this. Great advice on them getting softer the next day. what a great coincidence that you already bought everything to make ’em! hope they turn out for wonderful for you – can’t wait to hear how they go! OMG, my kids would just love these. Adore the pink frosting and sprinkles! These are so pretty! And I love the thick layer of pink frosting. Oh the pink frosting! I’m throwing a baby girl shower next month and these look like a perfect choice. Thanks as well for sharing all of those links – I can’t wait to check out the Pig Dip! Happy Monday, doll! thanks so much, ally! these would definitely be perfect for a baby shower, especially if you cut ’em into much smaller squares so they’re more of a one-bite treat. i love mini-desserts for parties + showers. happy monday! These look so unbelievably good! You frosted them so perfectly! As a sugar cookie lover these look quite dangerous Amy and oh so good. I must show willpower! oh, if you love sugar cookies you are going to loooove these. they’re even better than sugar cookies if you can believe it! I love the bright pink frosting and sprinkles! Definitely the perfect topping. Beautiful! Looks like the perfect hybrid of cake and cookie. Lovely. thanks so much, jackie. i love the way you describe it as a cookie/cake hybrid – that’s precisely what it is! These are amazing-looking cookie bars. They looks so dense and delicious! These look divine and so pretty! Love that they have the buttery flavor of a sugar cookie. YUM! You know me, I can *always* take sweets, and I would definitely take these! Gorgeous–and yummy, too, I have no doubt! I definitely pick these over just cookies – awesome recipe and photos! These are absolutely gorgeous and look so so yummy. I’ll take a dozen!! These are too cute! Great recipe for my belly because I LOVE sugar cookies. I am trying to cut down on sweets but you are making it quite difficult :p Your recipes are always top notch! Love em! you’re so sweet joanna – thank you! hope you absolutely love these if you give ’em a try. Amy, these are so cute. We are big fans of sugar cookies (always have some homemade dough in freezer ready to go). But this is a cool idea and good choice. Great recipe! I think I make this for my niece and nephews – they would love them for sure! (oh no, I’m not making them for me, wink wink). Wow! These look so good! I’ve been wanting to try these for awhile but have been hesitant b/c there are so many and I know I would end up eating them all I’m going to try to half the recipe and see how it works out! Thx for sharing! thanks so much, asiya! i think you could definitely halve the recipe. just use a smaller pan when you spread ’em out + bake ’em (i have a mini baking sheet that would work perfectly for it). i think you could even use a 9×9 pan, too. let me know how they turn out for you! Yum!!! Those look right up my alley! Once I have an oven again (oh the joys of living in a hotel haha), I’ll have to bake some!! Amy, these look ah-mazing! I love sugar cookies but sugar cookies in bar form is absolutely genius. There’s more volume in every bite, making it that much better. honestly, i like them even better than straight-up sugar cookies, if you can believe it! the cookie texture is so perfectly soft + surprisingly light. i can’t wait to hear how they turn out for you! The main reason I avoid making sugar cookies is the rolling and cutting. I love to make bars-so much easier. This is now on my “to do” list! i couldn’t agree more, cyndi – the rolling + cutting is my least favorite part of sugar cookies, + i loved that this recipe took both of those steps away + still had amazing results! Wow, they’re almost to pretty to eat! This is something my family would definitely love, and I’ll be trying out a GF version of them soon. ooh, i’d love to hear how the gluten-free version turns out so i can share it with my g.f. friends! hope it goes great! I love sugar cookies, but have never made them in bar form before. These are so pretty and sound delicious! i had never seen ’em in bar form before, either. i’m definitely glad i stumbled across the recipe, though, because i love ’em even more than the regular cookie version! What a fun idea! Those cookie bars look delicious! I am definitely pinning this!!! What a coincidence. A couple weeks ago I also made sugar cookie bars for the first time and they looked exactly like yours, pink frosting, sprinkles, and all.